I know two people in their 20’s who display old bowling balls artfully in their back yards. Think of a sculpture garden. You spy them here and there among the foliage. 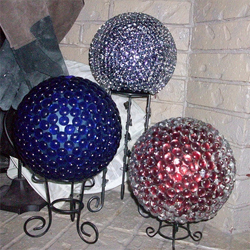 Well, people display “gazing balls,” and this is recycling! I’ve been to their gardens and really enjoy being surprised by the bowling balls. A plus, they won’t blow away! In case plain bowling balls are not your thing, take a look at all the ways you could decorate them. I’m thinking flat craft marbles could look nice and sparkly in the sun. You’d need to use 100% silicone E6000 to glue the marbles on. 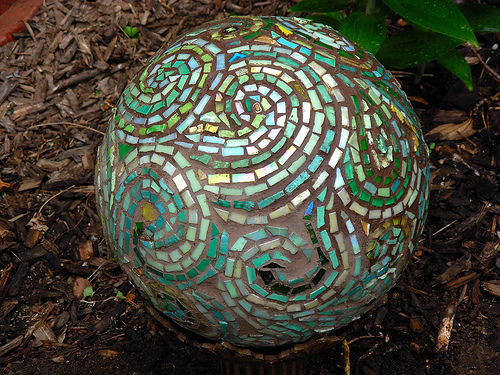 Or make a more traditional mosaic of broken ceramics cemented on. You can even cover the bowling ball in pennies! You can buy old bowling balls for cheap at yard sales. Most resale shops won’t take them. The linked website says you’ll need to bring them in when it gets cold as they can’t take freezing temperatures. Keeping them in the garage is fine. I just saw a revamped bowling ball used as a gazing ball in a yard the other day. It looks very cool! Click here to link to how-to tips at GardensAndCrafts. I had been tiny bit familiar of this your broadcast provided bright lear idea. Good news, Patrick! You can just put a bit of E6000 on the back of the marble and then place it on the bowling ball right away. Or it might be easier to put the E6000 on the bowling ball at the spot you want to place the marble. Probably you should work on a small area at a time & see what works best. Have fun! Hi Maggie – I am wanting to use E6000 to make a gazing bowling ball. I want to know if I need to apply E6000 to the glass bead and bowling ball, then let dry a few minutes before attaching them or can I just glue and stick them together to let them dry together. This was would make the process go faster. Can you help me? Hi, Margaret! Yes, I love your mosaic! Very beautiful. I hope you get lots of orders! I thought it was a great idea too. Since resale shops won’t take them, it’s a way to keep them out of landfills too. Enjoy! What a great idea! You get rid of the inconvenience of damaged gazing balls by using the bowling balls. They are really beautiful and I think it would be fun to do.